Here in the Midwest we've had an incredible streak of clear nights this past week. It's been literally years since I've seen this many clear nights in a row, let alone in March! To top it all off, I've been shooting every night with my brand new Rasa 8. Seems no sooner than I got the scope than the weather cleared up! This unguided image was taken on Saturday, when we had one of those 'California Blue Sky' cloudless days. 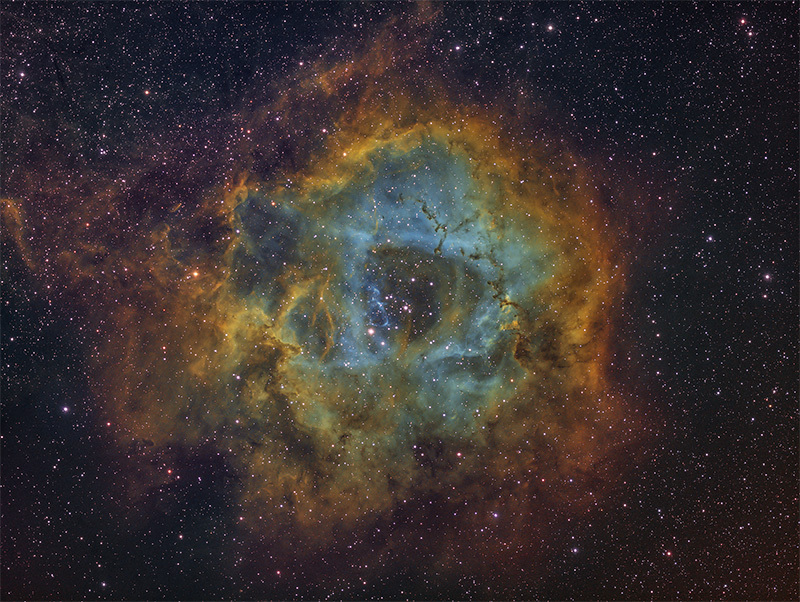 This is just 2.2 hrs integration via the Rasa and Baader F2 narrow band filters. Three sets of 30 subs, Ha Sii Oiii, 90 seconds each, Unity gain 139 at -10C. Processing was a combination of APP and PI. For some reason, APP was having trouble with the Oiii channel, so I processed that and the Sii channel in PI. Final color combination was in PSCC. I'm pretty happy with the way this came out, seeing as Orion was setting just two hours after astronomical twilight. I had started shooting this a few years back with my Ap 130, taking 16 hours to get the Ha and part of the Sii signal captured. Bad winter weather forced me to stop working on the mosaic for the past 3 years. The Rasa was purchased for just this very reason: tocollect enough data to create an image in a single night, in a few hours if possible. The saturation of this image is very close to what I was getting after 16 hours with my old scope, and yet this was done in just two hours. Excellent image man. The RASA is a legit scope. I just snagged the filter drawer from Starizona, and while I will still be doing some OSC work with this (which is going well) those F2 narrowband filters are tempting. great all over the field!